Esri announces the publication of Getting to Know Web GIS, third edition. Redlands, California—Esri, the global leader in spatial analytics, today announced the publication of Getting to Know Web GIS, third edition.The workbook provides clear, step-by-step instructions on how to use ArcGIS, the geographic information system (GIS) software platform developed by Esri, to create a variety of useful applications that can be hosted online, on premises, or in a hybrid of the two. Readers also will learn the fundamentals of Web GIS and put the web-based capabilities of ArcGIS into practice by analyzing and visualizing data and publishing maps, apps, and other geographic content. New in this third edition of the best-selling book are chapters or sections on image services, online raster analysis, big data analysis, vector tiles, virtual reality (VR), augmented reality (AR), the Internet of Things (IoT), and artificial intelligence (AI). There’s also new material that focuses on Survey123 for ArcGIS; Operations Dashboard for ArcGIS; ArcGIS API for Python; and ArcGIS Arcade, a new expression language. Tutorials in each chapter can be completed using ArcGIS Online and ArcGIS Pro, which are available with a free ArcGIS trial. 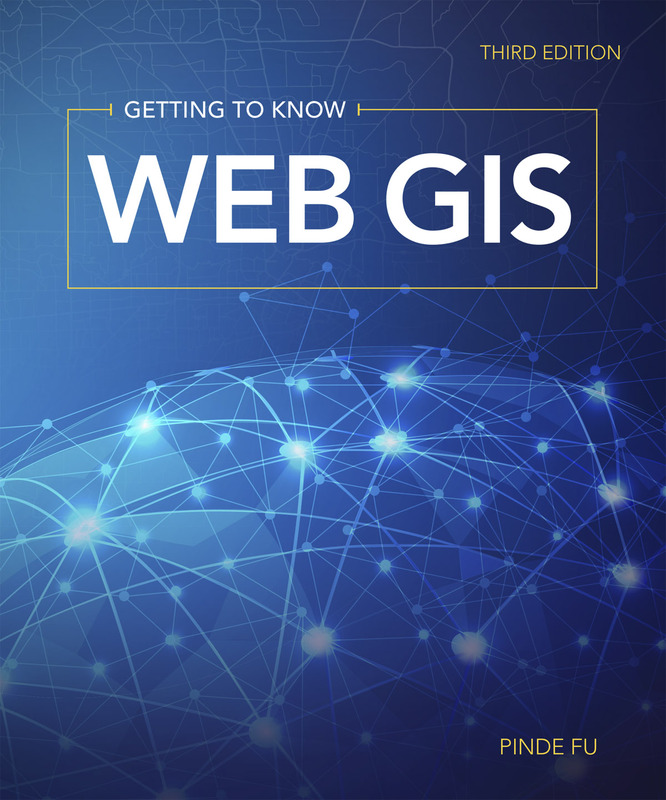 Getting to Know Web GIS was written by Pinde Fu, who leads the ArcGIS platform engineering team at Esri Professional Services. Jie Chang, an Esri software product engineer on the 3D analysis team, contributed the chapter on image services and raster analysis. Fu created his first web application in 1996 using Esri technology and has been a Web GIS advocate since then. He’s pleased to see the rapid advancements in ArcGIS in the realm of Web GIS, including the addition of new capabilities to build and publish 3D web applications. “You can now use ArcGIS Online to [display] beautiful web scenes,” Fu said. By writing this workbook, Fu hopes to help lay the groundwork for the creation of innovative geospatial apps within the GIS community. Students at more than 47 universities around the world have used the previous two editions of Getting to Know Web GIS in their coursework. The book also is a favorite of many GIS professionals. “I hope this book sparks [the] imagination and encourages creative uses of Web GIS,” Fu said. Getting to Know Web GIS , third edition, is available in print (ISBN: 9781589485211, 486 pages, US$94.99) and as an e-book (ISBN: 9781589485228, 486 pages, US$94.99). Both editions can be obtained from most online retailers worldwide. The print edition is available for purchase at esri.com/esripress or by calling 1-800-447-9778. If outside the United States, visit esri.com/esripressorders for complete ordering options, or visit esri.com/distributors to contact your local Esri distributor. Interested retailers can contact Esri Press book distributor Ingram Publisher Services.